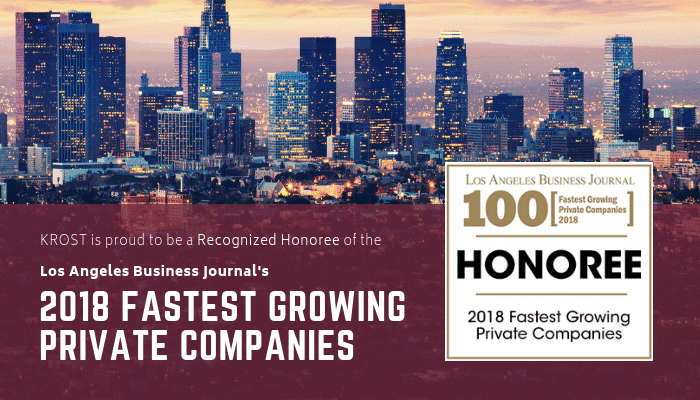 On Wednesday, November 7, 2018, KROST was recognized as one of Los Angeles Business Journals’ Fastest Growing Private Companies in Los Angeles County, with 63% growth in revenue between 2015 and 2017. KROST received this recognition during Los Angeles Business Journal’s 22th annual ceremony to honor a select group of private companies that have shown remarkable growth. KROST is a full-service Certified Public Accounting and Consulting firm headquartered in Pasadena, California. As trusted advisors and industry leaders, clients depend on KROST for timely information, innovative solutions, and results-driven teamwork in the areas of accounting, assurance, business management, tax, and consulting.